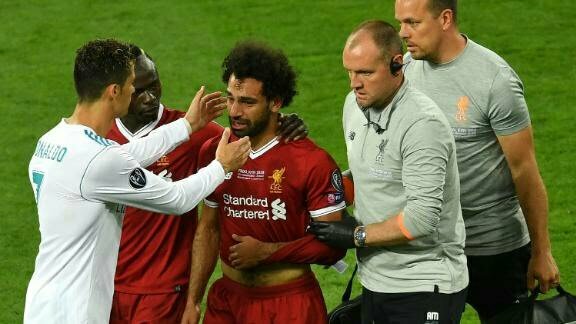 Liverpool talisman Mo Salah leaves game in first half with shoulder injury. It is now three titles in succession for Real Madrid to match Bayern Munich’s feat from 1974-76 and no team has won more than Los Blancos’ 13 crowns overall. Saturday’s final at the Olympic Stadium in Kiev will be remembered, most notably, for Bale’s sumptuous 64th-minute winner courtesy of an overhead kick — he only came on in the 61st. Let the debate begin: Which was the better goal, Bale’s or Ronaldo’s overhead kick against Juventus in the semifinals. Real Madrid’s Gareth Bale scored the winning goal in the Champions League final with a superb overhead kick. In perhaps the game’s most poignant moment, he was consoled by Ronaldo as he was substituted in the 30th minute. They both scored a staggering 44 club goals this term. In no danger as he collected the ball in the 51st minute, he attempted to throw to a teammate with Benzema lurking. Benzema alertly stuck out his right leg to intercept the pass and steer the ball into a gaping net. Karius wanted a foul but to no avail, and rightly so. There was quite simply no infraction. Mane, though, gave Liverpool hope when he latched on to Dejan Lovren’s header from a corner to make it 1-1. 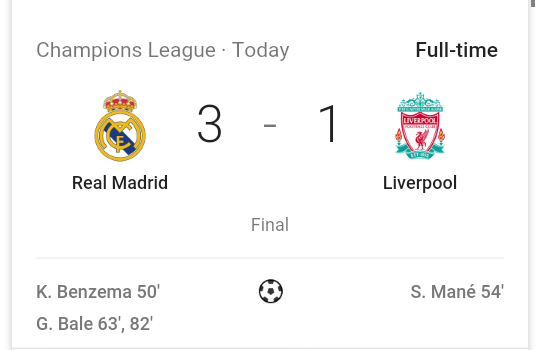 Liverpool led the Champions League in scoring entering the final, 10 goals better than Real Madrid, yet it would be the Reds’ lone goal of the night in Ukraine. Karius, in tears, made a gesture of apology to the Liverpool fans decked out in red at the final whistle. 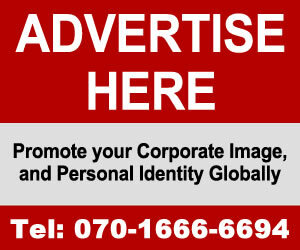 Zidane has been under pressure in the Spanish capital due to his team lagging behind bitter rival Barcelona in La Liga. But he has the golden touch in finals, winning all eight he has managed for Real Madrid, while Klopp has lost seven of his eight including his time in Germany. Twenty seven years later, there was some revenge for the undisputed Kings of Europe.